Although many engineers are familiar with draw wire position sensors, this article acts as a useful checklist of the most important factors that should be considered before specifying a sensor, as well as the benefits and limitations of this measuring principle. What electrical output options are required for the sensors? In principle, all commercially available and suitably sized rotary position sensors can be used as sensor elements in a draw wire sensor. This enables a wide variety of different output signals, from analogue signals (e.g. potentiometric, 4 ... 20 mA, 0 ... 10 V) to incremental signals (such as TTL, HTL, SSI) and digital fieldbuses (CANopen, CANBUS, Profibus, etc.). Nearly all common interfaces can be achieved. 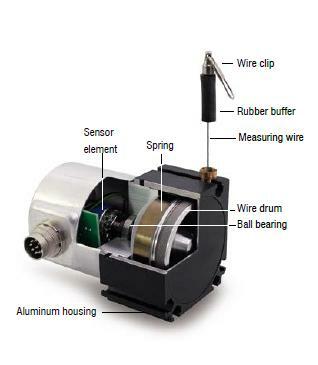 Most sensor suppliers can offer potentiometer, voltage, current, incremental and absolute encoder. For most engineers that specify or purchase draw wire sensors, the primary focus is not normally on the high technical performance of the sensor in terms of its resolution or speed. Instead, the focus is on a comprehensive ‘balanced’ package from the supplier based on technical requirements, durability and price. Engineers should therefore look for a supplier that provides a large choice of catalogue sensor products combined with years of experience, as well as a supplier with the capability to easily adapt its sensors to specific customer requirements.